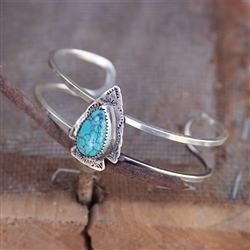 This custom arrowhead cuff is super trendy. It features a lovely bright piece of turquoise on a hand-cut sterling arrowhead. The arrowhead measures 1" x 3/4". The cuff is 5/8" wide.